Natural gas, a naturally obtained hydrocarbon gas mixture plays a vital role in various sectors. The usage of natural gas as a replacement for coal in electricity production, a lower-emission gas for heavy-duty vehicles, a low-carbon fuel for home heating, and many more has increased its demand tremendously. In turn, it raised the need for natural gas transmission systems as well. It requires an extensive and elaborate transmission system to transport this gas from the place of production to the consumer. That is, these industries use a complex network of pipelines to swiftly and efficiently transmit the natural gas. Also, some pipelines require compression stations, metering stations, and more to compress, monitor the gases, and perform other actions along the pipe periodically. It is a vast field with massive opportunities to explore. 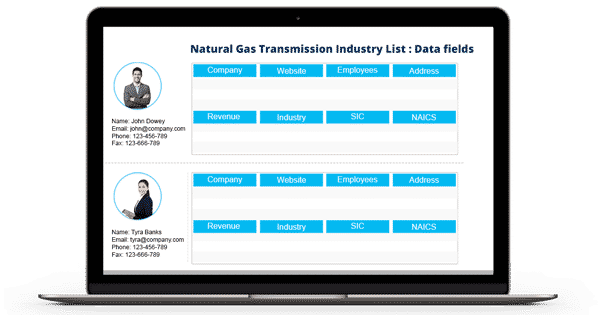 We help you to tap into this segment with the help of our highly reliable Natural Gas Transmission Industry Email List. To ease your task, we provide the list in both prepackaged and customized format. You can buy it from us in the exact arrangement required for your business operation. We provide best of the data in our Natural Gas Transmission Industries List. It consists of all the essential B2B marketing information in it. You have access to the various details on the prospect such as first name, last name, company, job title, revenue, and more. Hence you can set up a seamless interaction with them regardless of borderline constraints. Our database consists of the marketing records of industries situated in various regions such as North America, Europe, Asia, Australia, New Zealand, Africa, the Middle East, and South America. Therefore, you can successfully execute the marketing campaigns with no hassles. Our team of experts invests rigorous time and effort to keep the Natural Gas Transmission Industry Email Database free of redundancy and errors. They update the email list for every 90 days to keep it clean and afresh. You can trust our GDPR and Anti-Spam compliant Natural Gas Transmission Industries Executives List to stay ahead of the competition in the business world. Also, the team collects the data from authentic sources such as yellow pages, business directories, trade exhibitions, conferences, surveys, and more. Join us by availing our highly accurate list and improve your sales leads as well as ROI tremendously.